Captain Fancypants seemed happy that Munford Coldwater was sleeping at home that night and remained curled up and purring behind the backs of his knees until morning. The detective, though, slept intermittently, his slumber interrupted by lucid dreams of the professor and his wife wielding various medieval torture instruments while he struggled to free himself from a sophisticated array of ropes and chains. When the alarm had the nerve to go off at 8 am, he groggily made the Captain breakfast and then fed himself copious amounts of black coffee, along with soft boiled eggs and dry toast. He had to refill the French press twice. At 9:30, he fit himself into his most expensive black suit and a yellow tie with a pineapple motif that he chose specifically to add a little lively color to the ensemble. At the last minute, he filled a small flask with good bourbon and slid it into his breast pocket. It was a little early for that, but it was a kind of security blanket. He didn’t want to be caught without it if he needed it. For the same reason, the .25 was still in the glove box of Gustie’s station wagon downstairs. The funeral home was the Ridout Valley Chapel on the main drag in Homewood, just over the mountain from his Southside neighborhood. The parking lot was full to about 80% capacity when he arrived, more people than he had expected would attend. The professor was more popular than Coldwater had given him credit for. The widow wore a slightly more conservative black dress than the one she had worn to his office the night before. She was surrounded by some very stern-looking family members, so he kept his distance at first. When they accidentally made eye contact from across the room, he nodded to her, and she waved him to come over. Coldwater offered his condolences, and she introduced him to some of the pale skeletons in the vicinity: a mother, a father, and two prehistoric aunts. The mother looked like somebody’s idea of a Halloween costume. A thick white mane flamed out from her skull like it was gasping for oxygen. Her face, in contradiction to her hair, was youthful but her eyes were too big for it, giving the impression that she was perpetually surprised. Whenever someone spoke to her, her features intensified horribly, like someone had just rudely woken her from a restful nap. Her funeral garb was shrouded with elaborate black lace. She reminded him of wrought iron. The father and aunts shared the same distinguished Roman nose that the widow sported, but the family resemblance ended there. He was uncannily tall, at least six foot five, and he’d probably been handsome once, evidenced by a strong chin and wide shoulders. However, the rest of the man was a bony mess that looked to be on the verge of falling out of his suit onto the floor. His sisters, as Coldwater presumed, might have been twins, and they wore twin black shawls that seemed to have been imported from some other century. The two women were both chubby, though the fat on their bones appeared to have been hastily piled on in order to hide evidence of some wrongdoing. The mother then asked if they had been schoolmates at Sewanee, startling herself at the sound of her own high-born voice. “Something like that,” Coldwater said, hoping to evade further chit chat. “School of life, actually” he added after an awkward pause in which nobody else spoke. He shook all their frail hands and removed himself to a corner. Coldwater was surprised that Detective Gatlinburg didn’t make an appearance, but only a little bit. In one corner, a mass of youngsters who had probably been his students stood in a huddle, and near then were some tweed suits that were likely to be his colleagues from the English Department. He recognized a handful of other attendees from the poetry reading where he had first met the widow. It was hard to believe that had only been two nights ago. Only four nights had passed since the murder. Nothing much happened during the service. There was no drama. Nobody dropped the casket, causing the corpse to roll out gruesomely into the aisles. The professor didn’t suddenly spring back to life and point out the person who had murdered him. What crying there was, was quiet and dignified. 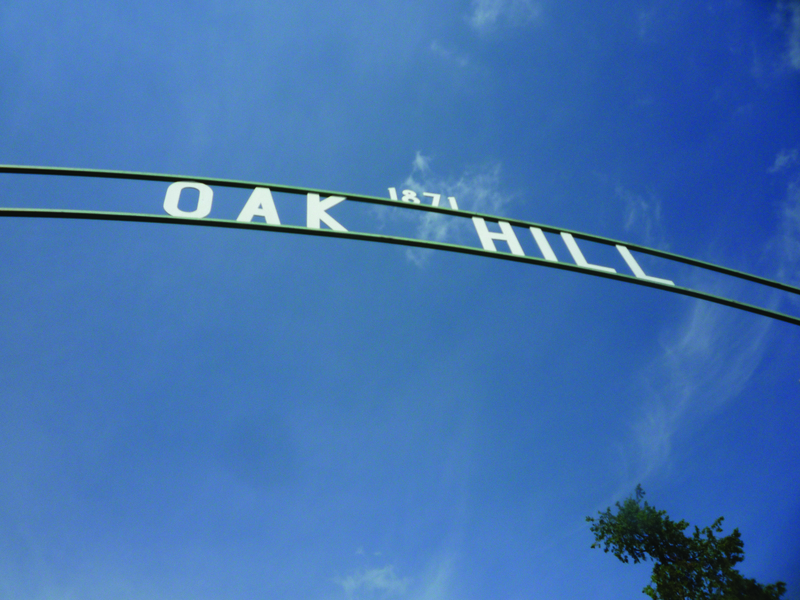 After the chapel service, he followed the motorcade to Oak Hill Cemetery, the oldest in the city, where most of Birmingham’s founding fathers were buried, including several of the widow’s ancestors. The professor would be joining them in the family crypt. On the way to the graveside service, Coldwater passed the resting place of Louise Wooster, the nineteenth-century Birmingham Madame who had been alluded to the night before during his conversation with the widow. She had converted her brothel into a hospital during the cholera epidemic of 1873. The Reverend Fred Shuttlesworth was there also, that shining knight of the Civil Rights movement who had died only a few years ago. Near the eastern fence, one of the ubiquitous magnolia trees had uprooted a gravestone so that it was leaned up against its neighbor. 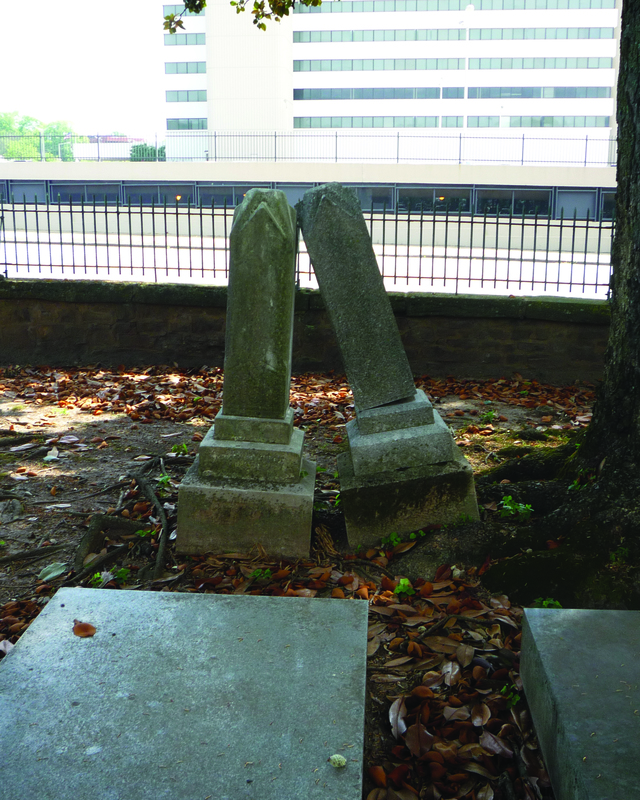 These kissing tombstones were a popular landmark, and countless young wannabe scribes in the area had been inspired by them to write some tragic love story, but the truth was that it was just an accident of nature. The two people buried there had not even known each other. It seemed fitting that Hornbuckle would be interred amidst all this history and local lore. Though he and the professor had not ever been especially close friends, Coldwater felt a twinge of sadness now over how many times they had been in close proximity without ever really getting to know one another. That was Birmingham, in a way, or maybe it was just him. He silently toasted the old boy and then slipped around behind a tall monument to take a swig from his flask. Again, nothing very interesting happened while they were there. Before he left, he made a point of shaking the widow’s hand again. Her hands were delicate, but not frail like those of her relatives, and they were strong. She held onto him for a few seconds longer than seemed appropriate to him.